..... Click the link for more information. . See also orders of architectureorders of architecture. The first and simplest of the orders, developed by the Dorian Greeks, consisting of relatively short shafts with flutes meeting with a sharp arris, simple undecorated capital, a square abacus, and no base. The entablature consists of a plain architrave, a frieze of triglyphs and metopes, and a cornice. The corona contained mutules in the soffit. one of the three principal Greek architectural orders. It developed in the Dorian region of ancient Greece in the period in which stone began to be used in the construction of temples and other public buildings. The Doric order was used as early as 600-590 B.C. in the first stone buildings on mainland Greece and in the Dorian colonies, for example, the Temple of Artemis, built at the beginning of the sixth century B.C. in Kerkira. The Doric order, the most severe and massive of the architectural orders, became the most important element of architectural composition in the sixth and fifth centuries B.C. and the main vehicle of artistic expressiveness in the architecture of the late archaic and classical periods. Many of the reconstructed buildings show evidence for the rejection of current architectural fashions for the Corinthian order and preference for the use of the Doric order. But what is most intriguing is that these triglyphs also appear on the recessed rounded corners of the wings, as if a Doric order is buried in the wall and exposed at these points--an essay in Mannerism which might be Turner's own invention. Scully's reference to the Doric order is interesting, in light of his position in the history of abstract painting. Although both use the Doric order, these elements are not integrated as they are, say, with Decimus Burton's nearby (Ionic) screen at Hyde Park Corner; instead, the entablature of the lower colonnades springs arbitrarily from the side walls of the pavilion. 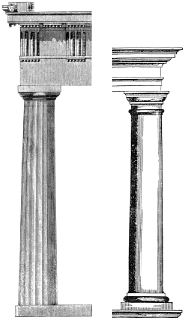 Ineptitude is demonstrated by the complete failure to integrate--or interpenetrate a lower Doric order with a double height Corinthian, as Cockwell, i. He fell in love with Corinthian and Doric orders, but the Greek ideal that Stuart helped to publicise became high fashion in Europe.